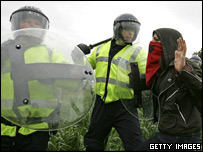 Demonstrations and violent clashes over the week of the G8 summit led to 358 arrests, police have revealed. Chief Constable Peter Wilson, who was in charge of security, said the operation had been a success and rejected claims of heavy-handedness. The biggest number of those arrested came from England, at more than 100, with 50 coming from Scotland, 35 from Germany and 30 from Belgium. 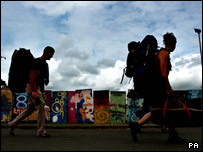 Eight people were detained overnight at an eco-campsite near Stirling. Some 10,000 officers from across the UK were drafted in as world leaders met at the Gleneagles summit, which wound up on Friday. The week saw running battles on Edinburgh's Princes Street, on the streets of Stirling and Bannockburn and at the summit security fence near Auchterarder. Chief Constable Wilson said: "We've seen an amazing combined police effort that has delivered what we sought - a safe and secure summit, an opportunity for legitimate protest and a capability to deal with any difficulties that emerged." He said there had only been 21 complaints made over police tactics and defended the actions of officers who clashed with anarchist protesters in Edinburgh on Monday. "The response in terms of the safety of the people of Edinburgh, as well as the safety of the police officers deployed, was entirely proportionate," he said. "We learned not to know on a day-by-day basis what we would have pitched at us, but I think we demonstrated that in Scotland there is a police force to be proud of." 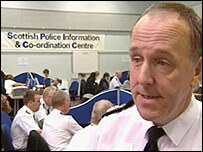 However, the Scottish Socialist Party has demanded an inquiry into G8 policing. MSP Carolyn Leckie said: "The conduct of the police must be examined, in particular the role of forces that came from outside Scotland who appeared to act in a completely uncontrolled manner on a number of occasions." More than 20 police officers and two police horses were injured throughout the summit, while 40 police vehicles were damaged. Saturday's arrests at the Stirling camp related to attacks on police earlier in the week, breach of the peace and bail offences. The chief constable said it was "entirely proper" to have had facilities for protesters coming from all over the world but it was disappointing the camp seemed to become a focus for trouble makers. Police estimate that about 250 protesters are left at the site. The remaining protesters have until midday on Tuesday to leave and tidy up the camp. A police spokesman said they would continue to assess the situation but did not want to be at the site any longer than necessary.